Buying your first violin can be an exciting yet daunting experience. Whether you are purchasing your first quality instrument after years of renting, or upgrading your original investment to a higher end instrument, there is often a never-ending list of questions that come along with the decision to buy. Where do you go, what do you do once you get there, and how do you know if a violin is right for you? Don't let all the question marks overwhelm you. Just keep a few key points in mind, relax, and enjoy the processes . . . after all it's not every day that you get to buy a new violin! -When choosing a violin shop, research different available options and ask people you know for recommendations. Perhaps the biggest question most people face when starting the search to buy an instrument is, "Where do I go?" The best way to find a reputable shop is to ask people you know and trust for recommendations. In most cases this means asking a teacher or another professional in the industry. In addition, don’t be afraid to do some searching yourself. Visit a variety of different violin shops and see what their customer service, instrument selection, and credentials are like. While many instrument dealers are honest and reputable, there are some who are not. Recommendations from people you know, along with visiting the shop will give you a pretty good idea of whether the dealer is on the up and up or not. 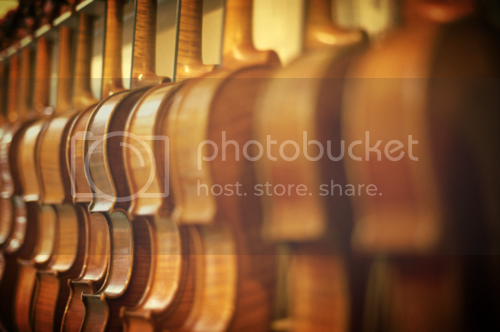 -Go to a violin shop rather than purchasing a violin online, sight unseen. To be honest, you might get lucky and end up with a fairly decent instrument by ordering from an online distributor, or eBay. Nevertheless, you're likely to end up with more than you bargain for. To begin with, most instruments you order online don’t come ready to play out of the box. You will need to set up the bridge and in some cases even put on the strings. This may sound simple, but in order for a violin to produce optimum sound, the bridge needs to be set very precisely in relation to the sound post. This requires the expertise of a luthier to be done correctly. Often lower end instruments you find online are quite heavy, thereby presenting a challenge for younger students in particular. However, the main reason to avoid buying an instrument online is the fact that you can’t play it before you purchase. You have no idea how it will sound, and more importantly how it will feel when you play it. Even if you purchase a violin with a return policy, you'll have to pack it up, send it back, order a different violin (again without trying it first) and repeat the process all over again. Save yourself a lot of unnecessary work, frustration and money; go to a shop where you can physically play all the instruments before you buy. -Allow plenty of time for your appointment. As you begin your appointment, the shop owner will lay out a selection of violins and bows for you to try that span the lower to higher spectrums of your price range. It is important to give yourself enough time to thoroughly play through all of the instruments. Pick an instrument to begin with and than continue to cycle through the line up, eliminating an instrument each time until you are left with your final choice. Sometimes you will be able to tell immediately whether an instrument is right for you or not. Even if you’re not a highly experienced player it is important to trust your instincts. After you have gone through the processes of elimination to choose a violin, it is important that you repeat the process to determine the correct bow for both you, and the instrument. -Bring a few pieces of music with you. Choose a few pieces of music that you feel extremely comfortable playing bring them with you to your appointment. Even if you can play from memory, having the music in front of you will help you to feel relaxed. Remember, you will be trying a series of new instruments in an unfamiliar setting, where other people may hear you play. The addition of these variables are bound to make you feel a bit more nervous than usual. It’s important to choose music you know well and feel comfortable with, otherwise you will focus on the technical challenges of the music, rather than thoroughly trying the instruments. That being said; don’t be afraid to test each violin and bow with a variety of styles and techniques. See how it feels when you play different bowing articulations, melody lines, double stops, chords, etc. You will generally know within a few moments of playing the violin whether or not it is a good fit for you, but nonetheless it’s a good idea to put each instrument you try through its paces. -Play the exact same thing on each instrument you try. Playing the same thing on each instrument will allow you to maintain a constant variable by which you can compare all the different bows and violins you try. You don’t need to play a complete piece on every instrument, but just selected parts from a few contrasting pieces should be sufficient. -Don’t be shy, dig in and really play each instrument. It can be intimidating to hold a new violin in your hands, but don’t worry you won’t break it. Don’t be afraid to play a wide range of dynamics and articulations on each instrument you try. However, be reasonable. While shop owners do expect you to dig in and try the instrument, they don’t appreciate you leaving a trail of broken strings and bow hair in your wake. -Try each instrument without asking the price first. Tell the shop owner your budget and ask to see a selection of violins within your price range, however don’t ask to see the individual price of the instruments until after you have made your final choice. As long as all the instruments are within your price range, your choice should be based on how the violin feels and responds rather then the price point. Keep in mind you are searching for an instrument to best fit your playing needs, and this is not always reflected in the price. Don’t assume the most expensive instrument is the best for you; it may be a great violin, but just not for you. Likewise, don’t go in and buy the cheapest instrument you can find. If the violin is not a good fit for you, you will spend a majority of your practice time fighting the instrument, which leads to frustration, and additional money spent to remedy the situation. I have seen students so frustrated by a violin with which they were mismatched, that they actually wanted to quit playing. -Ask your teacher to accompany you. If you are a first or even second time buyer, you may feel more comfortable having your teacher accompany you to your appointment to provide assistance and a second set of ears. If you would feel more comfortable having your teacher present at your appointment, simply ask. Most of the time teachers are happy to help. -Ask to take your final selection home to try. Often shop owners will allow you to take your final choice home for a week, so you can play it on a trial basis, and in a variety of settings before you making your final purchase. This option is very helpful if you are on the fence as to whether or not an instrument is the right fit for you, or if you don’t feel comfortable to make a same day purchase. If you do choose to take a violin home on a trial basis, play it in a variety of acoustical settings. However, only take a violin home if you are truly serious about purchasing it, and always be prompt in returning it to the shop if you decide it’s not the correct violin for you. -At the end of the day it’s your choice. While it’s helpful to have your teacher, parents, friends, coaches or even the shop owner offer their individual opinions, the bottom line is this; it will be your violin, and it has to be the best fit for you. It won’t be your teacher’s violin or your parent’s or friend’s violin, it will be yours. You have to make the final decision, and go with what feels right for you. Trust your instincts. Even if you are a relatively inexperienced player, you will be able to tell what works best for you. Don’t delay or cut corners - make sure your instrument is insured the moment it becomes yours! It may seem like a small thing, but you can quickly end up with a big bill if your instrument or bow is damaged. Accidents happen even if you are the most diligent and conscientious person. You'll avoid the possibility of any big headaches in the future by insuring your instrument and bow. If you are uncertain where to purchase instrument insurance ask the shop owner or your teacher for a recommendation. More than once I found it valuable to go back to the first 1-3 instruments I had eliminated. Sometimes it takes a bit to get really into the swing of the process, and something you eliminated immediately will, in a larger context, assume a different role. Even if a teacher can't accompany you, another performer, preferably a more advanced one, whose playing you are familiar with, can be an asset, as s/he can play the instruments for you. Although best not to listen to choosing-comments from such a one, as tastes differ, hearing the instrument away from your own ear provides valuable information. Good advice. I would say that unless one is spending more than $10000, there is not much point agonizing over it for months at a time or trying a hundreds of violins. Enlist the help of a knowledgeable professional and make sure you are getting a good sounding violin thats well made, set up correctly, and free of significant flaws. Find threeor four such instruments and pick the one you like best. It does not have to be Italian. For student instruments, consider buying from a reputable shop that lets you trade up. Regarding insurance, most homeowners insurance will allow a rider that will cover the instrument at replacement cost, so save your sales receipt. Riders ordinarily cover you for mysterious damage or loss. Make sure that includes loss from your vehicle. Remember that damage by a luthier is not considered mysterious. As a keen amateur violinist/viola player, I have two instruments of genuine quality. I am fortunate also to have a couple of "spares" of each, plus some respectable bows. If colleagues /teachers/friends tell me of an aspiring youngster, I am more than willing to lend out an instrument for an extended period. All I ask is that the recipient/parent should pay the nominal insurance on a £1000 instrument. The more strapped-for-cash the family, the more willing I am to help mout. Anything to get the next generation off the launch pad! I think guiding new buyer towards local dealers with teacher approval is sound advice for the violin economy. I love my luthier community, as quirky as they are. However, I have been selling Yita T/M 19's and OVH Master models with bow, case and set up for $400-500 that absolutely, without a snob ear question, blow the rosin off the junk that is passed off as mature student wood here in the great North West. Sure, it reinforces the "more for less" ideal that big box stores thrive on. But think of this - the low level, high quality manufacturers in China (and other low wage lands) will push the earlier low quality fiddles to the rubbish pile. Everyone plays a better violin. So here is my recommendation. Do some research, buy a violin at very little risk (small change, no snobbery, shows up at your door) from Yitamusic or Old violin house and either have it set up by a luthier or, SET it up yourself. If you can't, your teacher will. I love music stores, but the low level violins are not what they do well - even though their margins say otherwise. First violins should be bought from china on the cheap!